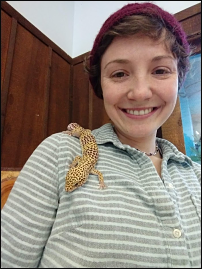 Ariel starting working at Upham Woods as a Teaching Naturalist in Fall 2018. We are so pleased she’ll be with us through the Spring 2019 season! Hello! My name is Ariel and I am currently a Teaching Naturalist at Upham Woods! I grew up in the beautiful northern woods of Wisconsin in a little town called Lake Tomahawk. Being in a rural, forested area surrounded by lakes, I quickly fell in love with nature and different outdoor activities. Each summer, my family and I would set out on a spontaneous camping adventure out west. We brought all our essential camping equipment and a road atlas without many plans at all. These trips really made me appreciate how magnificent our natural world is. After I decided to attend the University of WI Stevens Point, I soon realized that many people did not grow up surrounded by trees like I had. I had no idea one could study Environmental Education and Interpretation. It seemed like the perfect path for me, so I decided I wanted to spend my life connecting people to nature and conservation. I had the chance to study abroad in both Hungary for 5 months and Kenya for 1 month. I graduated in May of 2017 and have been working with youth outdoors ever since. On my free time, I enjoy knitting, reading, exploring new nature areas with my dog, and discovering local musicians with my husband. I am so grateful for my experience here at Upham Woods and for the opportunity to work with all the incredible people that visit us here. I will always value change, and I am looking forward to what else this crazy life has in store for me.